en tt cas, dans les video de kid icarus, il n'y a clairement pas beaucoup de polygones ni beaucoup d'ennemi a l'écran... donc dire que c'est supérieur a la wii, je ne pense pas. Tu vois un intérêt possible autre que visuel ? Minority Report, c'est en 2054. Pas avant ! Miyamoto semble avoir parlé de pouvoir changer la perspective en bougeant la console. Le truc, c'est que je ne vois pas trop comment ça peut coller avec un écran à barrière de parallaxe, vu que tu as une zone dans laquelle tu dois être pour profiter de la 3D. Ou alors, il faut que tu bouges avec la console. icy > pas mal disent que c'est supérieur à pas mal de jeux Wii. Quand tu vois les daubes visuelles que pondent certains éditeurs En tous cas, moi ça me plait pas mal d'avoir des graphismes de ce type. Après, paraît que Metal Gear Solid est plus impressionnant visuellement que Kid Icarus. Ils ne sont pas encore habitués à suivre l'actualité console (et l'actualité jeux-vidéo, en général). Ecran 3D tactile... A priori Nintendo n'a pas pu/voulu le faire, donc on verra si Apple osera... D'un autre coté, ce sont les spécialistes de l'appareil On-met-ce-qui-existe-dejà-dans-un-blender-et-on-vend-ce-qui-sort-super-cher-avec-notre-logo. sinon pour l'accéléromètre on n'a pas d'échos ? Joystiq: We knew the 3DS was coming. It was announced a while ago, but we didn't expect so many games to be available. How long have you been working on the technology? Shigeru Miyamoto: Nintendo's been researching 3-D games for over 20 years. The first time we started looking at 3D with an LCD screen was during the GameCube days. We've continued to experiment with it since then, particularly implementing it into the 3DS. That's something we've been working on for the past three years. With games, what's the ratio of Nintendo first party to third party? It seems like some of them are remakes, such as Star Fox. How many are new and updated experiences? When we first launched Nintendo DS, the touch screen became a new innovative face for gaming, and we spent a lot of time creating things that were probably different from the standard games that you've seen, games that are more like books or Brain Training type games. But with Nintendo 3DS, and specifically with the ability to create 3-D visuals, we're finding that, in addition to creating new game ideas, the 3-D visuals really do a lot for past experiences. It'll be a blend. We'll see remakes that take advantage of the 3-D, but we'll also work on new ideas as well.Steel Diver is a good example. It was a game that was originally designed for Nintendo DS, and as we began working on Nintendo 3DS, and saw the effects that the 3D could have in helping to create that undersea world, it was much better suited to taking advantage of those 3D visuals. Some gamers have flocked to the iPhone as a portable gaming device. Now that you've announced partnerships with movie studios, how do you use the 3DS to get those consumers back? We don't look at this specifically as a competition, but it's a topic that's come up a lot over the years. When cell phones first exploded and started taking over more than ten years ago, particularly in Europe, we got a lot of questions from people saying, "now that there are all these cell phones, are people going to stop buying portable game machines?" Of course, over the last ten years, we haven't seen that happen. Now we're seeing similar questions coming up in regard to the iPhone and iPod Touch. I think what's important is that what Nintendo can do on its own gaming device is different from what other companies are able to do on their own devices. As long as we're able to create compelling content they can only play on our systems, then people will want to carry our device around with them. 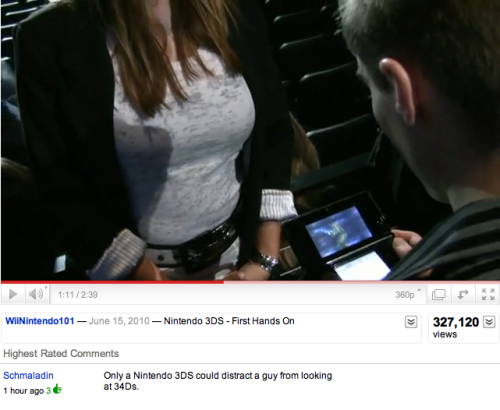 The 3DS is obviously more powerful than a DS. Some would say that it's as powerful as the Wii, but what does it equate to? Is it better than a GameCube? We haven't done a straight comparison test between the systems. This is obviously a portable system that you carry around, so we wonder how powerful it needs to be. We have shaders that people are able to take advantage of and create nicer looking graphics that we've never seen before on a handheld. The touch screen had a big effect on gameplay. With 3D, it's really just a monitor and how you look into it. What kind of gameplay effect will that have, or is it more about immersion? It actually starts to get complicated, because we've been talking about 3D games back when Mario 64 first came out, but that is in reference to games that are 3D in the sense of having fully rendered worlds that you can run around in. Now we're talking about 3D visuals through the effects of the Nintendo 3DS screen. Up until now, running around those worlds on a flat screen has made it difficult to discern the spatial relationship between objects, or how far away things are. A specific example is from a Mario game. With 3D visuals in a 3D world, it becomes much easier to identify where a question mark block is. Sometimes in a Mario game, if you're tring to hit the block, you run around and think you're underneath it, but you miss. That becomes vividly clear when you have 3D visuals. Similarly, trying to jump onto a tree in a Mario game is something that could have been difficult. With 3D visuals, you have such a clear sense of how far away objects are, that it becomes easier to navigate that space. Any ideas that we've had over the years that have been limited by a lack of depth perception in a fully rendered world are now ideas that can come to life because of the 3D visuals. With a game like Nintendogs, the dogs really pop up out of that screen and you can see them. You have a touch screen down below, and you're kind of looking and touching, and it feels like you're touching a real dog. It's also fun taking classic games from different consoles that we've released in the past and giving them that three dimensional depth. You see them come alive on the screen in that way and it makes you very happy. Now that the new Nintendogs has cats, will there be different types, and how does their behavior affect the gameplay? I started raising a cat. The thing about them that's interesting is that they're not necessarily an animal that you communicate with. They take communication from you, but don't give much in return. They're not about learning tricks, but cats will bring an interesting element to the gameplay in the way they interact with the puppies and how that relationship develops over time. You announced a new Donkey Kong game with Retro Studios. We haven't known what they've been up to since Metroid Prime 3. It's another update to a classic Nintendo franchise. How did that process start? How long has it been in the works? Well, I think it's good for game developers to work on a lot of different things. Of course, Retro had been working exclusively on the Metroid Prime series for a very long time, so that's where their focus was and it was a very specific kind of gameplay. We thought it might be a good idea for them to try something new, so we suggested they try their hand at Donkey Kong thinking that they would turn the idea down, but they jumped at the opportunity and said, "this sounds great. We really want to do this." So they were very excited by it. It looks similar to the old Donkey Kong games. Did you guys experiment with any different types of gameplay, like a Donkey Kong first-person game? [Laughs] We had been looking at the Donkey Kong franchise and thought Retro was a studio that would be really well suited to creating something in that style, particularly with their graphic capabilities and what they can do there. Of course, my team worked on Donkey Kong Jungle Beat, but with the Tokyo studio busy with the Mario Galaxy game, we were looking for someone who could take the Donkey Kong franchise and do something with it. Once we proposed the idea to them and they started looking at it, they wanted to do something similar to the Donkey Kong Country series and it came together relatively quickly. So back to 3DS, you guys talked about an online service for the platform. How similar is that to the DS online connection service and the Wii service? Are you guys fielding complaints about friend codes? I'm not really commenting on the working aspects of Nintendo 3DS today, but we're obviously looking at taking the elements from the Wii online service and the Nintendo DS online service that work well and trying to find a way to maximize those the best that we can. Look at what we've done with the Nintendo DS, and that will give you an idea what the starting point is for what we'll be doing on Nintendo 3DS. We're just going to try and improve it from there. Are DSiWare games supported? If I have something on my DSi, will I be able to play it on 3DS? I can't provide an answer to that right now. What about regular DS games? Yes, we announced backward compatibility, but we're not going into detail on how the DSiWare will work. Some gamers are upset that you didn't talk about Pikmin. Is it still on track? [Laughs] I don't like to talk about Pikmin much because it seems like every time I do it just creates more articles, but we are working on Pikmin. I think that maybe if you go to the booth and look at the lineup that we have, even if we had Pikmin here and released it soon, we already have so much content that maybe people wouldn't buy it. Skyward Swords is arguably the first Wii Zelda game, since Twilight Princess started on Gamecube and was modified for when it came out on both platforms. It's using Wii MotionPlus. How much different is that experience from Twilight Princess? We tried to talk about it a little bit during the presentation, but we had some wireless difficulties with the demo, so it didn't look as smooth. A big focus for us this time was not necessarily a comparison in terms of how this game is different from Twilight Princess, but how we're separating it from the Zelda series. What I mean by that is particularly with the control and how you're able to do so many different things by combining motion with just a few simple button presses. Particularly in this game, the fluidity of moving from sword to items and the realistic motions that you'll be doing to use these different items is going to be really important in terms of immersing you within the experience, making you feel like you're in that world doing those things. Even something as simple as the aiming, which is handled not necessarily with a pointer but by moving your hand around, just like you would aim an item in real life, will make it that much easier for you to feel like you're in that world of Hyrule and experiencing the adventure that Link is, because you're so connected to what's going on. Visually, it looks more like a Twilight Princess and Ocarina of Time than Majora's Mask or Wind Waker. Where do you think it fits with the Zelda library in terms of gameplay, visuals and style? I think that from a visual standpoint, it's probably something that's closer to some of the older Zelda games. There are two things that we strive for when creating a Zelda game. One is to make the experience easily understandable to people who are playing the game, and the other is to have an art style that is unique and can stand on its own. With this game in particular, because we've implemented Wii MotionPlus and the sword controls, so that the enemies actively defend against your sword control, it requires clear visual cues for you to understand what angle they are holding their sword at or what direction the mouth of the enemy is open at. The best way to create those types of visuals on screen is with characters that are somewhat over exaggerated. That's something that doesn't look good with hyper realistic style graphics. Nintendo has packed 3DS with so many features that it's not even promoting some of the major ones. Today's Nikkei detailed one such silent feature: software install. According to the paper, gamers will be able copy 3DS software to internal memory. Multiple games can be stored with the system in this fashion. You'll be able to switch between games by selecting a title from the system's main menu. The paper notes that due to this feature, there'll be no need to swap cartridges. When outside of the home, you won't need to carry game cartridges with you. Nikkei is a financial paper, so it obviously didn't get into the specifics on how this installation system will work. We'll have to wait for Nintendo to provide clarification. Hier en jouant de la zapette à moment critique, je tombe sur M6 info, ils parlaient de l'E3. Arrive le tour de la 3DS et là on voit un type faire des câlins à un tigre. Deux secondes plus tard je me suis dit : et si on pouvait faire la même chose IRL avec les filles, ça va devenir vachement drôle. Mettre la main aux fesses sans risques de se manger un aller-retour ou tripoter ses lolos, waouh quel pied. Ben voila une bonne chose de faite et confirmée : il y a plein de mecs normaux pervers sur cette planète. Je ne plaisante pas, j'ai vraiment pensé à ça. Donc je n'ai plus besoin d'aller me cacher à chaque fois que j'ai une idée tordue: vous êtes pareils. La 3DS dès le 25 mars 2011 ? Bien que Nintendo ait confirmé que la 3DS sortirait au plus tard en avril 2011 en Europe, aucune date précise n'a encore été communiquée pour son lancement. Toutefois, la page dédiée à Paper Mario 3DS sur le site officiel français de Nintendo indiquait, il y a encore quelques heures, une sortie du jeu prévue pour le 25 mars 2011. Une fuite, probablement, puisque l'information n'est plus visible à l'heure actuelle. Comme vous pouvez le voir sur cette capture d'écran, Nintendo s'explique en disant qu' « une erreur technique a indiqué une date de sortie erronée ». On peut donc imaginer que la console pourrait sortir à la date du 25 mars 2011 !